The VM95 Series cartridge with 0.6 mil conical stylus fits half-inch mount turntables. The cartridge's special coil design delivers a powerful output level of 4.0 mV. It also offers excellent channel separation and low distortion for outstanding tonal quality. The durable, low-resonance housing includes threaded inserts that enable the cartridge to be mounted to the headshell with just two screws - no nuts required. And since all VM95 Series share the same body, the stylus can be replaced with any of the six interchangeable AT-VMN95 replacement styli. The AT-VM95C is equipped with dual moving magnets that are positioned to match the left and right channels in the stereo record groove for outstanding channel separation and extended frequency response. 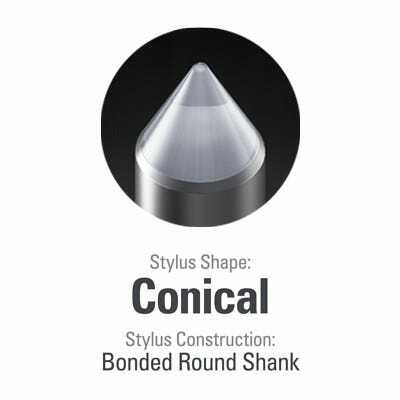 The round conical stylus is less likely to be affected by placement and boasts stable tracing performance. All Audio-Technica products include a 12 month Australian Limited Warranty.